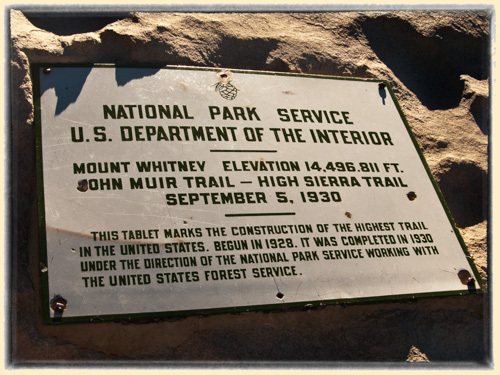 Every hiker who succeeds at thru-hiking the John Muir Trail also accomplishes something else fairly impressive: he or she summits Mount Whitney, the highest point in the contiguous United States. But who was the first to reach the top? Great question. In June of 1871, Clarence King, a renowned surveyor and mountaineer, was on his way from San Francisco to Wyoming to continue his survey of the fortieth parallel. A personal ambition, however, caused him to take a brief side trip. He headed south, to Lone Pine. His ambition was to be the first to summit Mount Whitney, a peak he had a hand in discovering and naming. The expedition began in August and took three days. On the second day he achieved the summit. He wrote an account of what he saw and gave a thorough, but oddly inaccurate, description of Mount Tyndall. He also apparently failed to notice that the “Mount Tyndall” he was describing was higher than the one he stood on—a curious fact given that nearest mountain higher than Mount Whitney is more than a thousand miles away. That’s because he wasn’t on Whitney; he was on what would later be called Mount Langley. He was describing Whitney, not Tyndall. Two years later (during which he was hailed as the man who had conquered Whitney), the mistake was discovered. When King was informed that he was not, in fact, the first to the summit, he hurried back to California (from the east of the country) for another attempt. He finally arrived at the true summit of Mount Whitney on September 19, 1873, only to find bad news: a hastily constructed monument listed the names of three climbers who had already been there. Those climbers, named Hunter, Crapo and Rabe, had taken a route over Cottonwood Pass, through Whitney Meadows, and had reached the peak on September 6th, thirteen days before King. Rabe had a barometer with him and verified the elevation. They left the summit, that day, convinced that they had managed to be the first to bag the peak. The three did better than King in his first attempt two years earlier: they had climbed the right mountain, but they were not the first. A month earlier, in August of 1873, a large group of Lone Pine residents had escaped the scorching summer heat by taking an excursion into the high country. While there they rode, relaxed, fished and generally enjoyed the scenery and cooler temperatures. Unlike King, however, they noted that there was a higher peak nearby. The next day, on August 18th, 1873, they summited that peak, which was the true Mount Whitney—a fact they didn’t know at the time (they were just trying to get to the highest point they could see). They assumed that their peak was unnamed, and decided to call the mountain “Fisherman’s Peak”, no doubt after failing to get majority support for Mount Begole, Mount Lucas, or Mount Johnson. Controversy raged in the months ahead over who got there first, and the name “Mount Whitney” didn’t become undisputed until the middle of the next century (more to come on that in a later blog post), but the consensus, today, is that three recreational fisherman, on a lark, bested everyone else. Well, except for the countless indigenous North Americans who had managed the feat earlier, and whose accomplishments went unrecorded. Nicely done. Thanks for this, Ray. Great write up Ray. I am always intrigued by the story behind the story. Paul Harvey would have enjoyed this one! Great writing, and thank-you for the acknowledgement in the last paragraph. Thanks, Susan. I appreciate the comment! Do you have a photo of the summit register for pages showing the Jul 2nd entries?? Someone I know is looking for that page! Sorry, Rob, I do not. If they live close to Lone Pine, people do the hike almost every day this time of year. Perhaps they could get a photo.